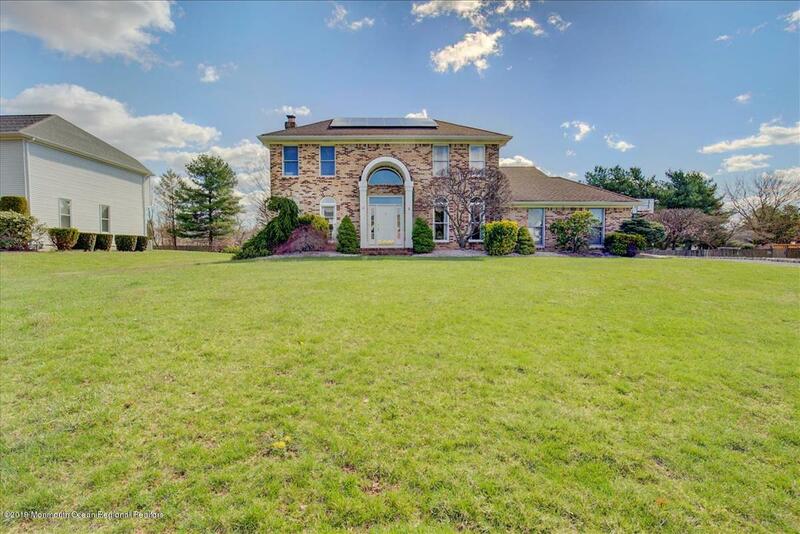 *IMMACULATE* Brick Front, Center Hall Colonial w/ Finished Basement in One Of Freehold Township's Most Desirable Developments, Crown Pointe! Perfect Location Withing The Neighborhood, On A Quiet, Family Friendly Street w/ Large, Level Half Acre Lot! Soaring 2 Story Foyer, W/ High Ceilings, & Open Floor Plan Makes This Home Great For Entertaining! Large Eat In Kitchen Flows Into Cozy Family Room w/ Wood Burning Fireplace And Slider To Huge Deck Overlooking Large Level Backyard! Spacious Living Room and Dining Room With Plenty Of Natural Light! 3 Spacious Bedrooms Upstairs w/ Vaulted Ceiling in Master + Large Sitting Room Can Be Used As 4th Bedrm/Office! FINISHED BASEMENT Adds Extra Living/Storage Space! NEWER Roof, Furnace, AC, HWH, & Minutes From Downtown Freehold, & Easy Access To Rt 18! !